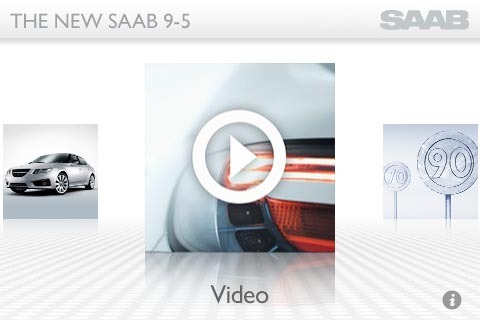 In iPhone and iPad application news, Saab released a new app for the launch of the 9-5. 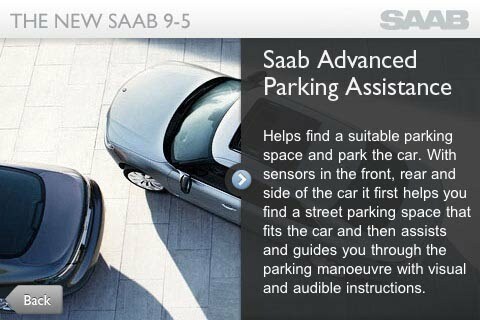 I believe this is Saab's first application on either platform and unfortunately it's not much of an effort. The application merely mimics the content from their website where feature pages, a 360, an image gallery, and intro video are provided as content in the app. There is nothing more than the reuse of existing content repackaged for an application. It's very similar to what Mercedes did for the C63 AMG two-years ago. I personally would've like to have seen some handraiser implementation within the application so the company could engage further with the app's users provided of course they are not disappointed after downloading something they basically could have seen on their iPhone or iPad's web browser. Oh well, hopefully we'll see some more interesting things as Saab gets ready to spend big for their "Change Perspective" 9-5 launch.